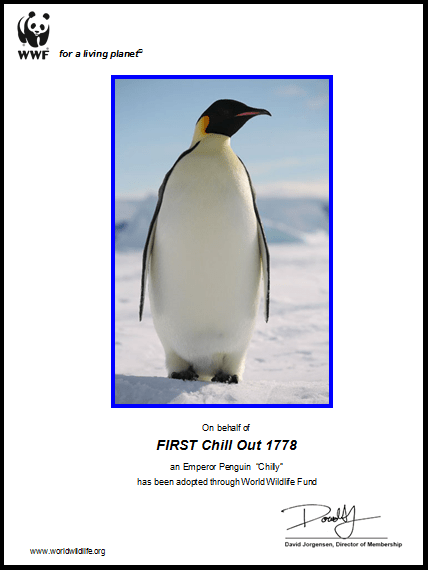 On 2/6/16, Chill Out officially adopted an Emperor penguin, naming it Chilly. The adoption was through World Wildlife Fund and the donation will go to help protect Emperor penguins against climate change and habitat loss. Emperor penguins live on the floating ice packs and islands of Antarctica. Known as the "giant of the penguins," an adult can grow up to four feet in height and weigh 80 pounds. Flightless and clumsy on land, these birds are most at home underwater, where they feed on a diet of crustaceans, small fish and squid. Because of their type of prey the emperor penguin tends to dive more deeply and stay underwater longer than most other penguin species.